Vets from the Philippines bureau of fisheries and aquatic resources measure the carcass of a 300-kg (660-pound) juvenile whale shark that washed ashore along a fishing village in Tanza town, Cavite province, west of Manila on September 5, 2013. The dead whale shark washed ashore far from the endangered giant fish’s traditional feeding grounds, fishermen and a wildlife official said Thursday. 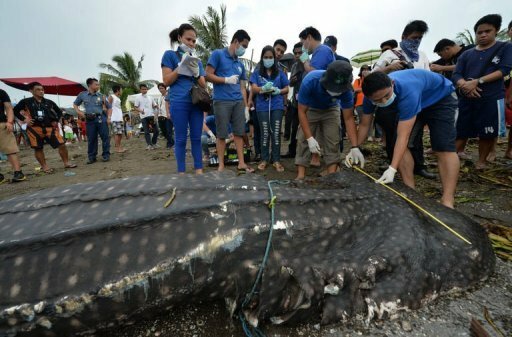 MANILA (AFP) – (AFP) – A dead young whale shark has washed ashore in Manila Bay near the Philippine capital, far from the endangered giant fish’s traditional feeding grounds, fishermen and a wildlife official said Thursday. The five-metre (17-foot) corpse took locals by surprise in Tanza, a fishing district near the mouth of the bay, fisherman Edgar Biri told AFP. « It was near the shore, we thought it was some kind of a deadly shark, » he said. Local fisheries bureau veterinarian Marco Espiritu said he would examine the 300 kilogram (660 pound) carcass to determine the cause of death. « It is unusual to see whale sharks around these parts, » he told AFP. « Their migratory patterns are far from here, but it may have been following food that’s why it came into the bay, » he added. In 2009, he said a dead whale shark about the same size was found at a busy wharf on Manila Bay. Whale sharks (Rhincodon typus), the largest fish species in the world, are slow-moving creatures that can reach 12 metres in length and weigh more than 20 tonnes, feeding mostly on plankton, small fish and crustaceans. Found in all tropical and warm seas of the world, they show up in large numbers between April and May in plankton-rich areas far from Manila. Switzerland-based watchdog group the International Union for Conservation of Nature (IUCN) has placed the species in its list of « vulnerable » species. Philippine fishermen once hunted the fish, but the practice has been outlawed and its annual migration has become a tourist draw in some central Philippine coastal resorts.